What dolphins taught me about harmonious family life. 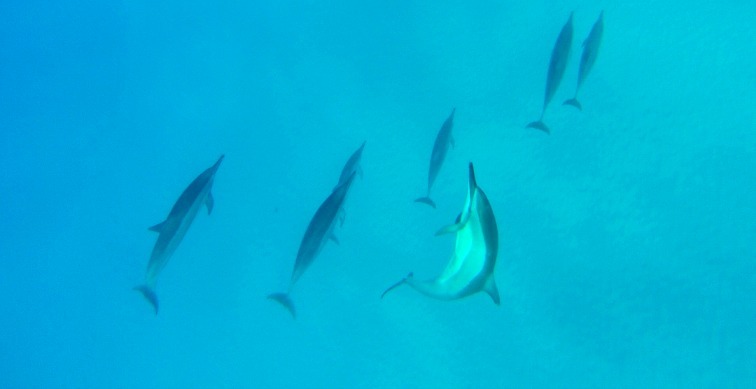 I recently had the privilege of swimming with wild dolphins off the Kona coast of the Big Island, Hawaii with dolphin researcher and advocate Roberta Goodman. It taught me a lot about family harmony and living in flow. I’m not very familiar with dolphins. I’ve seen Bottlenose dolphins playing in the surf in Australia but I’ve never seen a captive dolphin show or been up close in the water. 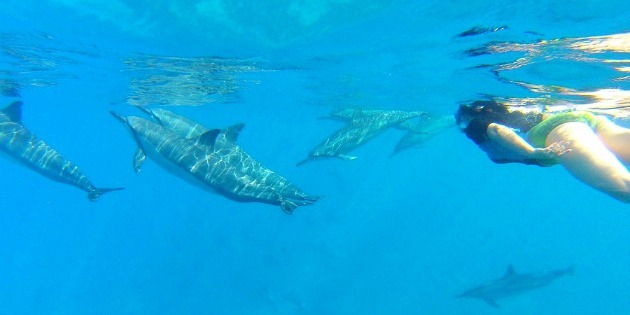 Hawaiian spinner dolphins are much smaller than Bottlenose dolphins and travel in larger pods. They hunt at night in the deep waters off the Kona coast and they come into shallow water during the day to play, sleep and socialize. This brings them into close contact with humans who use these crystal clear waters to fish, surf, dive, sail and swim. 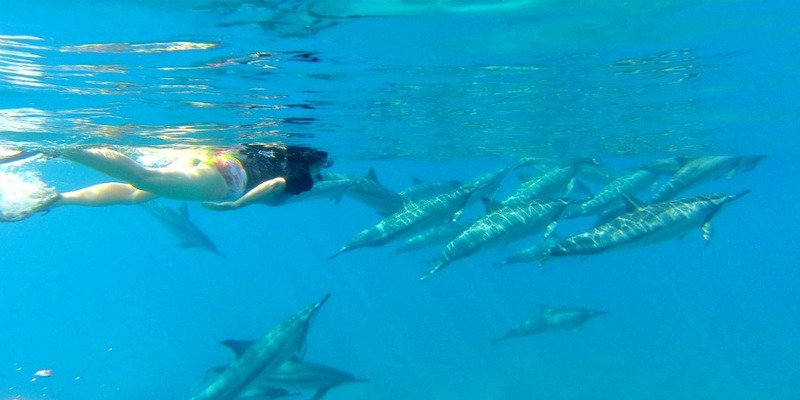 These wild dolphins don’t avoid human contact. 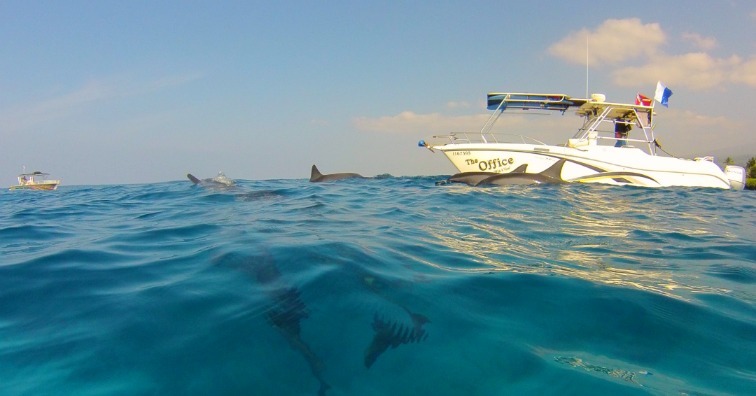 Long stretches of coastal water are empty of people and yet dolphins linger in the area where boats are gathered and snorkelers are in the water eager to see them. Barbara has been swimming with these dolphins for 20 years and she confirmed that these dolphins seek out and seem to enjoy their interactions with the people who come to meet them. My son and I were lucky enough to have beautiful calm weather for our morning of dolphin watching. We were with a small group of two guides and 5 visitors. The captain of the boat kept watch for dolphins and dropped us in the water just ahead of where they would swim past. The first few times we were in the water the dolphin pod swam past at their “travelling” speed. We had a short and delightful view as we swam hard to keep pace but we soon dropped behind them. There were a few other boats in the area and other snorkelers in the water waiting for a chance to see the dolphins swim past as they cruised up and down the coast. The dolphins obliged by slowing down and cruising around the gathered observers allowing us to swim alongside them for longer. They started playing with us, swimming up behind us and then zipping past very close. A few times we saw individuals leave the pod and leap up out of the water in a magnificent spin and then slip back into the flow of the dolphin group. I lost all sense of time as I watched these delightful creatures. There was so much to take in! The flow of the pod as they moved through the water was effortless and graceful. They truly moved as one, like a school of fish or a flock of wild birds. And yet, there were also bursts of individual expression as one or more dolphins swerved out of the group to do their own thing. It was clear to me after even this small time observing them that these dolphins experience both a collective consciousness as well as an individual consciousness. Dolphins are one of the few animals (along with higher primates such as humans and chimpanzees) that can recognize themselves when looking at their image in a mirror. Research by Diana Reiss revealed that once a dolphin figures out that the image in the mirror is himself, he will explore his body, gaze into his own eyes, check out his teeth, and display various body parts for self-inspection. This indicates that they have a sense of an individual self or individual consciousness. In this respect we have much more in common with dolphins than with most other animals. This inspires me to be particularly open to what I might learn from them. What inspired me about Spinner dolphins was the grace and harmony of their movement. They appeared relaxed, attentive and playful and moved in perfect flow. There was no observable tension between the flow of the pod and the flow of individuals. Individuals surged upwards to leap into the air or swept off to the side on a personal investigation then returned to the pod. There was effortless expression of collective and also individual consciousness. It is this harmonious flow between the group and the individual that I want to experience more of in my own family. Dolphins don’t experience family on the same scale as I do. Pods of varying sizes form and reform out of a total population of about 750 individuals along the Kona coast. Roberta explained that all 750 dolphins are essentially one family and share a pod consciousness. That’s a lot of individuals to accommodate into one family! It’s all the more remarkable that they exhibit such graceful flow in their lives. Respecting the unique individual expression of each member of my family while maintaining some sort of family cohesion often seems hard, even with only four of us. It was even harder while we were on holiday in Hawaii as we were out of our normal routine and making decisions day-to-day about what we would do next. We often fell into struggle and conflict. I feared that my individual desires would have to be sacrificed so that others could get what they wanted. Does living and traveling as a family mean limiting myself and settling for less? Does it require limiting compromises for all of us? The contrast between my family life and the joyful energy of the dolphins was thrown into sharp focus. I learned some time ago that you can’t struggle your way to peace. I often need to remind myself of this. Acceptance has to come first; acceptance of what is appearing in my life at this moment, even if that is struggle. This means accepting all the fear, frustration, tears and anger that can arise during family conflict. The easiest way to accept my stressful thoughts and feelings is to turn my attention towards that place within me that’s not struggling. I recognize the aware consciousness that observes all thoughts, images and feelings and allow myself to simply rest in Beingness. Once I remember that aspect of myself that is beyond thoughts and mental images I can allow the pure energy to of emotion to move through me. Maybe this is why dolphins appear so relaxed and joyful. They aren’t so identified with their thoughts. They probably haven’t spent a lifetime constructing an identity and an ego and welding it together with stories of lack, deficiency and unworthiness like us humans. They embody Beingness more closely than we do. Instead of trying to get rid of family conflict I focus on remembering that graceful flow is a natural state of being for all life. We are all supported within the flow of Life, Presence, Consciousness, whatever you wish to call it. We may not be able to see how things are going to work out but I have learned to trust that they will. Over and over I have found evidence that there is always a solution that everybody can be happy with or at least accept. There is a way that I can express my individual journey while honouring the flow of our family life and the desires of each member. There is a way to balance collective and individual consciousness. Perhaps balance is not the right word. It implies that one aspect has to be limited in order to balance with another aspect. The flow and grace that I observed in the dolphins did not hold that energy of limitation. They gifted me with this inspiration; it is always possible to expand and open up to more of the infinite possibilities that already exist. Within the field of infinite possibilities lies a solution to every conflict that does not require anyone to feel held back or limited. I trust that accepting and feeling my difficult feelings does not mean that I will be stuck in those feelings forever. I trust that change is constant. What people want can shift at any moment. Circumstances change. Opportunities arise. I trust that it is fine for this family to change over time, as it must. Children grow up. Relationships shift. I question my fear that I won’t get what I want. It only creates contraction, clinging and neediness. I question my belief that I have to try harder and do more to make things work out. I opt for less doing and more Being. I question my belief that I have to control life in any way. This spiritual practice allows some of the constructed identity and ego to dissolve. The “small self” dissolves into an expanded self that has far more freedom and can move with the flow. The intention to find solutions that respect both individual and group consciousness sends out the call to attract them, and they appear! Shifting out of a mindset of control and into the expanded space and flow of Beingness is delicious. It’s delicious and also messy. It’s not uniformly full of peace, quiet and happiness, although there is more of that than there used to be. There is still room for challenges, disagreements and upwellings of fear, anger and sadness. I noticed that the lives of the dolphins were not free of challenge or pain either. Many of them showed scars where Cookiecutter sharks had taken a chunk out of them while they were fishing in deep water. They must experience the impact of human fishing, pollution and military activities too. I don’t doubt that dolphins experience a range of emotions. But it seems they don’t suppress them or cling onto them the way many of us do. The wonderful grace and playfulness that they express is testament to this. ♥ Life calls for a certain surrender but it never requires sacrifice, it never requires limitation. ♥ There is no limit to how far we can expand to embrace every aspect of consciousness. ♥ There will always be inspiration and support to draw us onwards, whether that is through a meeting with dolphins or simply sitting with our children at home in the suburbs. I am deeply grateful for all of it. Freya thank you for sharing! What a lovely article and the photos are amazing too! I love how you put together these information on “What dolphins taught me about harmonious family life.”. Easy to read, very relatable and great tips! Can’t wait to read more!